I have read a few suggestions on this board that Michigan's Rieslings are really good. How good? Is the state's wine industry poised to make a big splash, or is it just a flash-in-the-pan also-ran to other eastern appellations? Any chance it could become a major appellation within the next 50 years or so? Or will it always be a wine hinterland? well, it is hard to make a big splash when you are a small(so far)rock. that is we have less than 3000 acres of vineyard. granted riesling is our largest planted variety(for wine grapes) but there are many others. and we are still experimenting: gewurz, p. gris, p. blanc and others show real promise. nearly all of what we make is sold instate - which limits the 'splash'. our rieslings win gold medals and best of's regularly so not a 'flash in the pan' in that regard. i'd say they were as good as finger lakes or ontario. they may seem more flashy and splashy because they are big in NYC and Toronto respectively. we have Detroit; but....... so far we have not attracted the kind of money one needs to be splashy - enough to plant a lot of grapes and build very large destination edifaces. personally i'm fond of dry riesling especially and i drink a mix of michigan, alsacian, german and austrian. at 70 plus years i am not drinking patriotically; but to get the best of can in the time i have left. David summed it up much better than I could (and he knows more about Michigan wine than just about anyone) and I agree with him. One of my favorites is a Pinot Blanc that comes from a 1 acre vineyard. There are several others I like that come from equally small plots. Quality of the whites is getting very good but quantity will always limit the availability. Some reds are fairly good too but still not like the blancs. That's why I asked about 50 years from now. I know it's small. You're all going to think this is pretty stupid, given that I am working in a somewhat responsible position in the CA wine industry, but there is a job opening to develop a community college winemaking and viticulture program in MI. It sounds like fun. What I envision is a far more professional program than most. Who knows whether they would even want me- I'm not the easiest guy with whom to work. Still, it sounds a bit more fulfilling than what I'm doing now, and it would be an adventure. Only, however, if there is the potential for really great wine to be made. Just a thought. When we decided to move back to the US from Germany I did extensive research on the suitability of Riesling regarding climate, geology, and marketing for just about every wine-growing region in the Country. What scared me away from MI and NY were the low winter temps and short growing season. The moderating influence of the lakes only extend a few short miles from the shore which means that there is very little land suitable for growing even cold(er) tolerent vinifera vines like Riesling. Using even the hardiest clones you start experiencing giant rates of winter-kill at -8 degrees fahrenheit. Winter 2013-14 will likely be a devastating year for both regions. That the suitable land is so limited will surely be the biggest factor holding back the industry in MI and NY. 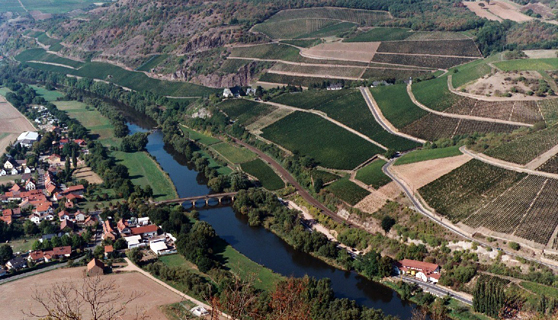 This is not to say that there isn't good Riesling being produced in these regions now, only that the potential for much more is unlikely from my perspective. Hi Bill. Be that as it may, how much of the western coast of MI is currently devoted to vineyard, and how much to other crops? There's a goodly amount of coastline for the size of the state. In other words, is there more suitable land that can be purchased at reasonable cost, or are we at the limits at the current time? Obviously, if they are saturated now, then what's the use of an academic program? But the community college seemed to think there was the potential of multiples of what they currently had, enough to make a program worthwhile. I'm not trying to dissuade you, only stating the reasons why I wouldn't invest my own money or labor to the cause. As you know, vines aren't the same as other crops, having to overwinter during extreme temps above ground. I suggest that you get ahold of some of the better-known MI producers like Chateau Grand Traverse and ask them how they manage and what the potential might be. Most of that region is climate zone 6a. Craig, as Bill and David have already mentioned, the growing area in Michigan for fine wines is seemingly quite small. Most of the MI wines that I've liked have come from the area around Traverse City (Old Mission Peninsula, Grand Traverse County, Antrim County, Leelanau County). I would guess that there's less than 100 sq. mi. of land suited to viticulture there. I've had wines from elsewhere in the state, most notably from the Fenn Valley region, but they have been -- to put it charitably -- not my style of wine. Ya, that was my fear, of course, but I wanted to play devil's advocate. I don't like giving up until I have exhausted the potential. Riesling is one of the few major varieties I have never had the opportunity to make (except my first year in the industry, when all my wines were crap). And Riesling was one of my first loves, when I was a kid, yet, and German whites, along with Bordeaux, were the 2 main occupants of the cellar. This year will be a tough test for loss due to temperature. I’m in Traverse City and it’s been an extremely cold year. I think I heard ‘the coldest since the 70’s’. Expecting -10 tonight and I know growers are worried. There is good snow cover but I don’t know how much that helps. Take this with a giant grain of salt but I would be far more encouraged if this was the University of Michigan (Ann Arbor) and not a community college. Seems very risky to me. If there was the potential for very great wine I would think it would already be happening, no? Tom Troiano wrote: Take this with a giant grain of salt but I would be far more encouraged if this was the University of Michigan (Ann Arbor) and not a community college. Seems very risky to me. If there was the potential for very great wine I would think it would already be happening, no? Tom, I can’t agree with you here. If you said Michigan State I might but when it comes to Michigan, they are known for several things but agriculture is not one. Some of the local schools probably could be better also. When it comes to football U of M is better (or at least they used to be). Take this with a giant grain of salt but I would be far more encouraged if this was the Michigan State (East Lansing) and not a community college. I'm surpised no Ag at Ann Arbor. I attended the University of Illinois as a math major and every "real world" math problem we ever did involved fertilizer, pesticide, etc. on test plots of corn and soy beans. My point really is that this seems really risky and would be less risky if some big university was doing this. MSU was originally the Agricultural College of Michigan, a forerunner to the Land Grant Schools established by the Morrill Act. Michigan then established the University of Michigan to teach the other subjects common to a Liberal Arts education. The same dichotomy exists in Indiana, with my humble employer established by the Morrill Act to teach "agriculture and the mechanical arts" and IU established to teach all those other subjects. Michigan State has an interdepartmental Enology program, an interdepartmental viticulture program. It has a winery. First of all, a lot of these universities have a course or 2 in the particulars of enology, but no real major. I looked briefly at Michigan State's Agricultural majors- no enology major, no fermentation science major, and even in Food Science no enology concentration. They do give a credential of some sort, evidently, but not something that would be called a 4 year course of study. Perhaps extension courses. This community college wants to start a department exclusively for this course of study. Perhaps it could be a feeder school to a new or renewed and refurbished 4 year program through Michigan State. Perhaps the community college department could stand on its own for its quality. You know, even Santa Rosa Community College just has a lecturer, though it has vineyards and a winery associated with it. If a community college just gets some wannabe farmers from the surrounding community to teach courses, it will end up with a program not worth anything except the cellar rats who spring from its loins. But if they really are interested in a high quality program run by 1 or more industry professionals, they could find that it rivals anything that Michigan State currently has. All that depends, of course, on a future industry worthy of promotion, else it will be a short-lived program. Far more worrisome is if the quality production is geographically limited to Leelanau and Mission peninsulas and other parts north. I would imagine Lake Leelanau would be a natural on its northern coast, assuming some south-facing slopes. But if the land is flat and doesn't have south or west facing hills, and has good, rich, lowland soils, then no wonder if the west side of the state isn't making very good wine. I just simply don't know the topography of Michigan, to know where south and west facing bluffs might be found close to the coast. If it is a matter of soil and or exposure that gives the north part of the mitten is advantage, then there's no hope at all for growth of the industry. On the other hand, if it is simply the home of the most established vineyards, and the home of the best winemakers, then presumably there's some potential. There is a huge amount of land suitable for viticulture all along the coast at least as far as Traverse City and slightly further north. nearly half of the wine grapes grown in the southwest corner and nearly half in the leelanau/old mission area - with some in benzie and oceana counties and established vineyards near Fennville. leelanau and old mission are hilly with many south facing slopes. the soils are very mixed but are mainly the result of various glaciers grinding down the rock. further south it becomes slightly more flat; but the GDD;s are much higher. the lake effect is supposed to extend about 25 miles inland. as with many other new world locations there is still the possibility of discovering matches of grapes to climate and soil that have not been so far. yes, many of the winemakers are very talented. one of them just added to a long list of best of's with a win for a riesling at the east meets west challenge- or a name something like that. riesling can and has produced very fine wine here - your definition of 'great 'required. no cuve fred yet; but...... anyway, there is plenty of room to grow and plenty of reason to think that very fine wines are possible. Universities: U of M would not be the place for viticulture. MSU did have a program but a combination of a cut in state funding to all universities and a low number of students doomed the program. there is a viticulturist there and there are experimental vineyards in various locations. i think a community college program would be a good idea - they seem to be doing fairly well financially. why not visit to get a lay of the land so to speak. Postscript: I applied for the directorship of the program, and was rejected. Unfortunate, I think. In doing a search of the medals winners of various competitions, I find the sparking wines of MI to have done extremely well. In order to differentiate themselves from other wine producing regions, and gain a significant national niche, perhaps a concentration in sparking wines is in order, only secondarily delving into Germanic-style whites. Sorry to hear that. That's a bummer.